After running the South Downs Way 100 at the beginning of June, by mid-July I realised I hadn’t actually run a marathon for quite some time. I was supposed to run a marathon at the end of the Bastion Full Triathlon, but of course, I didn’t finish that race. So, as a training run, on July 18th I did the Three Forts Challenge course and then scoured the internet for a suitable marathon to do a week later. That’s when I discovered the Bath Running Festival Marathon. Organised by Relish Running the Bath Running Festival comprises a 5k, 10k, a long half marathon and a marathon. All the races were predominantly off road with a good amount of elevation. I have a love-hate relationship with hills. I don’t want them but I need them. I curse them as I climb but I embrace them at the top and thank them for being there. The Bath Running Festival also combined nicely with a little trip I was taking to Devon to film Martin Yelling on his Long Run Home challenge. So it was that on Sunday 24th July, I found myself on campus at Bath University in the sunshine, camera in hand at the start line of the Bath Running Festival Marathon. The start area was quite busy with lots of runners entered for the shorter distances. However, there weren’t so many hardy souls signed up for the full marathon. One or two chaps I spoke to told me it was a really tough course. I’m fairly hardy so I took it in my stride and prepared myself for a decent challenge. The half marathon runners were sent off first at 10am. Then after a short delay we were off at 10:15. Quite a late start for a marathon really. The first part of the course heads out on a path through the university grounds and out onto the trail through the woods and fields surrounding Bath Golf Club. There are some lovely views in this early part of the race and passing Sham Castle (an eighteenth-century folly) is a highlight. The route then heads down the very steep North Road to the canal where there is the first aid station and then a long, flat but very pretty section passing the moored barges. This, in fact, marks the start of the loop which we would do twice. I have been to Bath on many occasions but this route was taking me to places I had never been before. The canal section took us all the way along to the George Inn where we turned left to Bathampton Mill along the River Avon for a few hundred metres before the second aid station. Next came the first climb heading up, first on Fosse Lane and then on trail parallel to Bannerdown Road, route of the original Roman Fosse Way. I managed to run the full length of the ascent and felt strong as I ran through long grass at the top to aid station number three. 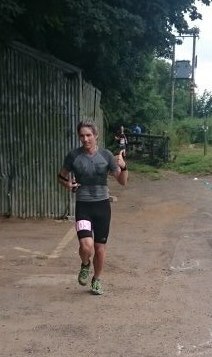 It was really warm now and the regular aid stations were very welcome. A few more fields, a short country lane and then a big, technical descent through low trees with tree roots and loose rocks underfoot. This was fun and cooler than being out in the direct sun, so was very welcome. However, next was the toughest bit of climbing at around 14km. After turning of the country lane at Northend we started at steep, ascent up a wet rocky, tree-root covered narrow ravine. It was simply not possible to run up this and would have been foolhardy considering we all knew we had to do it again at 34km! Thankfully at the top was another aid station. As well as drinks and some food there were a couple of children with a hose pipe! I resisted the urge to get soaked and carried on. This first loop of the Bath Running Festival Marathon was gorgeous. A little way on after another gradual climb we reached Solsbury Hill Fort with lovely views over Batheaston and the countryside below. Then came the descent back into the village to aid station number 4, which in fact was also aid station number two by the River Avon. We ran back along the opposite side of the river and back to the canal for the flat section back to aid station one and the turn point. I was trying to count runners as I came back along to see what position I was in but I couldn’t be sure. I felt pretty good as I headed out back along the canal for the second time round the loop. It was nice saying hello and well done to runners coming in the opposite direction. Some finishing their half marathon, others finishing loop one of the marathon. Amazingly when I got to the first big hill at Fosse Lane I was still able to run up it all the way. I was mighty impressed with myself and I left a few runners behind on the climb! I started to feel like I wanted to race. It’s always difficult when I’m supposed to be filming to run at pace and still get decent shots. I usually reach an acceptable compromise! It was drizzling as we ran along the top fields but I found myself passing a few runners. Then as I approached a marshall he shouted I was in 16th place. My competitive spirit kicked in and I could see a top 10 finish ahead if I kept up a decent pace. I walked up the rocky ravine incline, but at pace because I could see two runners ahead. I had caught up with them by the time we reached the aid station at the top. Unfortunately, I spent too long drinking and they were off ahead again. It took me a while but I did catch them. The weather had closed in more now and it was starting to rain quite heavily. The view second time round from the top of Solsbury Hill Fort was almost non-existent and I was glad I’d filmed it earlier on. 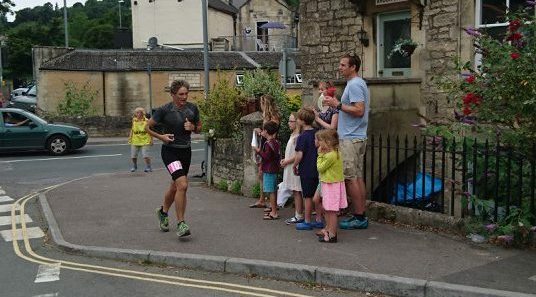 I caught another two runners on the descent into Batheaston village and I thought I must be in 11th or 12th place by now! I was on a mission now and I didn’t stop at the aid station by the river at all, thinking I needed to make it to the end of the canal section to put a bit of distance between me and those behind. I didn’t catch anyone else as I ran along the canal for the final time. All that remained of the Bath Running Festival Marathon was one final, huge climb on the road back up to the university campus. 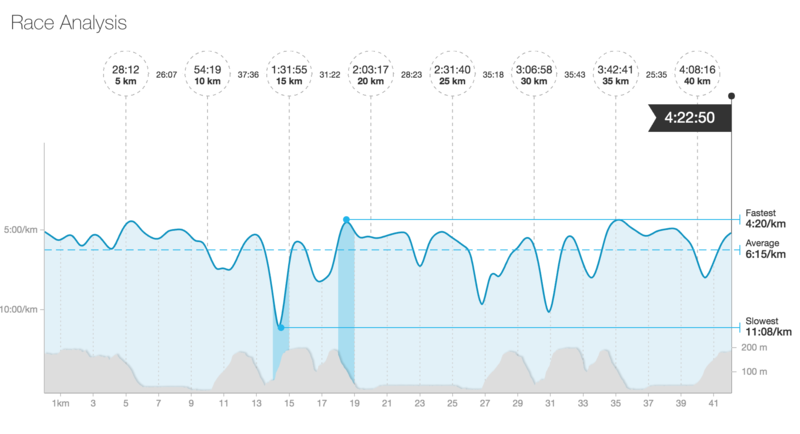 I hate hills at the best of times, but today was my day and I ran the entire hill catching two more runners on the way. Surely I was in the top 10 by now!! I picked up pace running through the grounds of Bath University back to the start/finish area. It was a shame that, because of the heavy downpour earlier in the day, what was a bustling, busy place a few hours ago was now almost deserted. I ran into the finish and stopped my watch at 4 hours 22 minutes and 50 seconds having covered 42 kilometres and well over 1000 metres of elevation. Annoyingly, when I asked Tom, the race director, what my finish position was, he checked and said I came 13th!! So I guess the marshal who told me I was in 16th place was a little way off with his counting! Ah well, it’s still a decent finishing position on a tough course, given that I was filming as well. Plus, a couple of weeks later I received an unexpected parcel in the post. It was a prize from Relish Running for coming second in my age category for the Bath Running Festival Marathon. The results on the website show that there were 76 finishers. So 13th is not a bad day’s work. 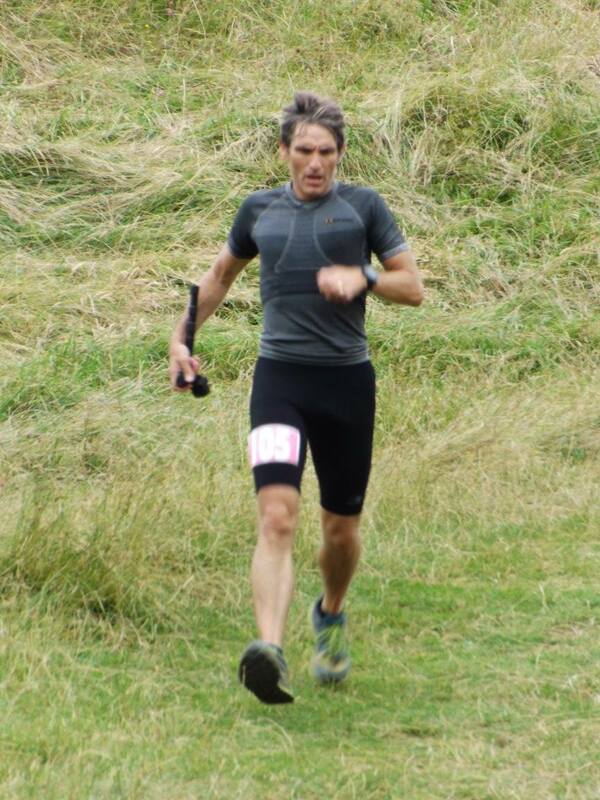 I thoroughly enjoyed my day at the Bath Running Festival. Thanks to Relish Running for inviting me and as always to the volunteers and marshalls along the route, who give up their time for free. The marathon is a challenging course but it has some fantastic views and it took me to places I had never seen before. It’s definitely a race which deserves to grow and it would be great to do it again without the camera and with 500 runners taking part. I was very impressed with the frequency of the aid stations. I was never far from the next one and on a hot day with a course like that they were certainly welcome…even if I missed the second to last one out. If you have enjoyed reading this Bath Running Festival marathon race report then please do give it a ‘like’ and share it with your friends or anyone you know who might like to run the race next year.